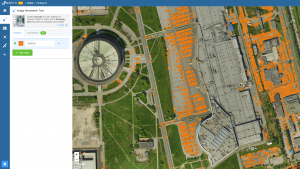 The Swiss start-up Picterra, based in Lausanne recently released the beta version of their software for Earth observation. This AI based tool not only makes it easier to analyse drone or satellite images, it is also a platform for peer cooperation, moving the technology forward. Picterra was born in 2016 from the minds of Frank de Morsier, Chief Technology Officer, with an electrical engineering background, and Pierrick Poulenas, Chief Executive Officer. Today the company is situated at the EPFL Innovation Park in Lausanne. Recently, the company released the beta version of their tool for Earth Observation. This tool is a customizable system that allows users to analyse drone or satellite images. At the same time, it puts them in touch with a global community that collaborates to develop such technology further. Thanks to the pre-trained machine-learning algorithms, users can personalise their aerial data analysis to perfectly match their own applications. This August, Innovation Forum had the pleasure of meeting the Picterra team and discovering what’s behind their success and what’s next for this fast-growing start-up. Hi guys! Can you briefly describe how Picterra got to where it is today? Frank (de Morsier): Picterra started 2 years ago, when Pierrick and I realized that we wanted to do our own thing instead of working as consultants, as we were doing in our previous roles. Then, for about a year, we worked on different projects and services, warming up our ideas with the aim of creating a unique tool directly usable by our customers. To do this, we needed financing and last Autumn, when we found an investor, the team started to grow: Julien, Roger and Leo joined shortly after. Throughout, this journey I’ve learnt how important it is to find the right partner who can bridge your gaps, for example the commercial experience provided by Pierrick, as a Business Developer. Can you give us examples of applications for which Picterra can be used? Frank: Picterra can help anyone who wants to analyse earth observation data, either privately acquired with drones or from available satellite data. For instance, we have worked on a project to automatically detect vegetation growing dangerously close to electric powerlines. Other customers were interested in analysing a time series of images to track down illegal deforestation in national parks in South America and Asia. Thanks to satellite images, which are acquired nearly every day, our tool has accelerated research, which otherwise would have taken months in such wide and wild regions. In general, our goal is to provide a semi-automatic tool for a wide spectrum of clients. How important was it for you to be integrated in the EPFL and Lausanne start-up ecosystem in the initial stages? Frank: The beginning of Picterra started out in our flats, but we soon realized that moving to an actual start-up environment could be beneficial. We took a base at the Innovation Park in 2016, where we encountered many useful opportunities. We attended the CTI courses at the Innovation Park, which were valuable, and we also benefited from the mentoring offered, especially for the financing stage. We saw that your beta version has just been released. How does it feel and how did the community react? a tool which allows them to “learn” about their data, but one that also provides fully customisable software by enabling a “hands-on” state available. Are these users your previous clients? Or did you have to work a lot on promotion? Frank: We already had a base, some companies with drones for example, but we have done quite a lot of advertising too, especially via social media and the media. The recent article on the EPFL website also helped people to find out about our platform and in the end we were contacted directly by many new users. Although we tried to push the local network first, both small and larger companies from Europe, and some from the US and middle Asia showed interests in our product. This is probably not so surprising because our tool is really for those who are anticipating the evolution of AI in this field. We get the impression that many recent start-ups are involved with imaging and drones: how does Picterra distinguish itself from other local competitors? Frank: On our side, we basically provide an earth observation and remote sensing tool: once the user loads the image on the AI platform, a library of possible elements that our tool is able to recognise becomes available and the users can ultimately extract the information they are looking for. This library then enriches in time and thanks to the users themselves, because if some elements are not already available in the library, they can be created manually by them. In this way, we offer a tool that is customisable and reusable thanks to our pre-trained algorithms. 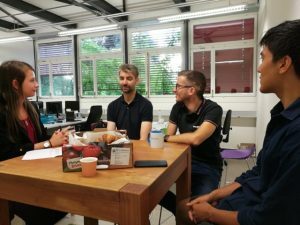 Drones and image processing are indeed a very popular topic right now and other start-ups on the EPFL Campus are also working in this field. Gamaya, for example, helps farming businesses by providing hyperspectral analysis of terrains for clients with specific types of crops, while we try to equip our users with an interactive tool instead of simply delivering a result. Another close reality is Pix4D, whose 3D images of reconstructions and orthomosaics can then be used for element recognition in our platform, showing a nice way of complementing one another. gathering a lot of users, who create machine learning models and share them with each other. We wish to start a snowball effect: as there are more users, there will be more models, more data and eventually a gigantic library of connected models and data, so that everyone can get what they want very fast. Have you heard of MapSwipe? It is a mobile app developed for the Missing Maps Project to enable fast satellite image classification on mobile devices. Users can detect small villages or roads directly on their phones by tapping and swiping on satellite images. Through MapSwipe, they can also join emergency response efforts led by the Humanitarian OpenStreetMap Team (HOT) when an active crisis arises. Frank: We have often seen this crowdsourcing approach, and, in a certain way, it is similar to what people do on our platform by outlining specific elements. Picterra could certainly help this humanitarian project and deliver results very quickly. We are actually discussing with several NGOs in this field to equip them with this. Julien: We could imagine introducing the “swiping” option to make the validation stage faster: once the model is trained, users could swipe to check whether the learning algorithm is correct or if some elements need to be re-added. However, to crowdsource, we must have the right to show the images and this might be challenging for most of our clients, whose images are confidential. And finally: what are your next steps? Frank: At the moment, we have a lot of subscribed users using our beta version for free and our goal is to provide a paying-mode option. Regarding the tool itself we are working towards a full customization of the algorithms. Last, but not least, we are already looking ahead to the next financing round, planning to enlarge the group next year.